One of the vintage’s most prodigious wines, the 2003 may be a modern day clone of the1959 Lafite Rothschild. Unusually opulent and viscous, with a dense purple color and an amazingly complex nose of scorched earth, Asian soy, balsamic vinegar, black currants, plums, and even some figs, Lafite tips the scales at 12.75% alcohol (less than they expected). The final blend is 86% Cabernet Sauvignon, 9% Merlot, 3% Cabernet Franc, and 2% Petit Verdot. A wine of great intensity, tremendous viscosity and density with low acidity (the pH is pushing 4), and a magnificent finish, but all with great precision, purity, and freshness, this is a tour de force in winemaking and something that simply has to be tasted to be believed. I have never had another Lafite Rothschild anything like it, and those who would argue that the 1982 or 1959 are cut from the same mold may have some supportive evidence. Anticipated maturity: 2010-2050+. 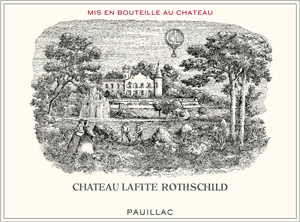 Revealing enormous richness, flesh, and succulence, the 2003 Lafite Rothschild is one of the candidates for “wine of the vintage.” A blend of 86% Cabernet Sauvignon, 9% Merlot, 3% Cabernet Franc, and 2% Petit Verdot (the Merlot was harvested between September 8 - 12, and the Cabernet Sauvignon between September 15 - 24), it possesses ethereal richness as well as perfume. Yields were a low 34 hectoliters per hectare, there is just under 13% natural alcohol, and the pH level is frightfully high at 3.9 with a total acidity of only 2.9. These figures are nearly identical to such ripe, concentrated vintages as 1982 and 1959. Inky/ruby/purple-colored with a spectacular, ripe perfume of black fruits, cedar, Asian soy, and balsamic vinegar, it exhibits massive richness yet is remarkably fresh and lively on the palate for such an unctuous effort (amazing levels of glycerin). In that sense, it is atypical, but like the 1982, I suspect the 2003 will become more delineated as the tannin emerges over the next 1-2 years. An amazing textural impression left me scratching my head as I have never tasted a Lafite Rothschild quite like this. This is one first-growth worth mortgaging the house for! Anticipated maturity: 2010-2035. Subtle, complex aromas of berrry, licorice and currant. Full-bodied and very well intergrated. Wonderful length and finesse. Exciting, yet polished and refined. This is a rich and structured Lafite. Very classic style. Deep lively purplish crimson. This is a very exciting wine which manages to be primarily a fine Lafite and only then an expression of the extreme ripeness of the vintage. There is no exaggeration here and most of all the dancing finesse of lafite on song. Deep and concentrated - and still introvert but it opened out to great delicacy. Pure Lafite with extra ripeness of 2003 and a little spike of leafiness on the edge to keep it lively. Round and opulent on the mid palate but never heavy. Sweeter than usual but there is sufficient acidity and a nice dry kick of dryness to keep it all in check and beautifully airbourne. 2003 Lafite placed third overall, out of 100 wines tasted blind, at the 2003 Farr Vintners Blind Tasting held in October 2010.